The Gefen HD-3G-C converts audio and video from HDMI to 3G-SDI and single link HD-SDI. Resolutions up to 1080p Full HD and audio formats up to 8 channels of LPCM are supported. This product is fully compatible with the Gefen Syner-G� software suite. The Gefen Syner-G� is a powerful set of software tools specifically designed to help discover, configure/customize, manage, monitor, and upgrade Gefen products. The Gefen EXT-HD-3G-C's compact enclosure, while light enough to be held in place using double sided Velcro� tape, features an ISO standard 1/4-20 attachment provision as well as a detachable surface-mounting bracket. This, along with a flexible power input circuitry capable of accepting a wide range of DC voltages and a locking power supply connector, make the EXT-HD-3G-C ideal for cutting edge mobile A/V applications as well as high performance fixed installations. This product can be installed on camera gear via an industry-standard 1/4-20 attachment thread located on the bottom of the unit. It can also be surface-mounted using the included surface mounting bracket. The EXT-HD-3G-C is light and compact enough to be held in place using Velcro� if your particular installation does not allow for the two preferred methods of installation described above. Set the DIP switches as necessary. Connect an SDI cable between the output of the EXT-HD-3G-C and an SDI display or other downstream equipment. Connect the HDMI source to the HDMI input of the EXT-HD-3G-C using the included Locking HDMI cable. Connect the included 12V DC power supply to the 3GSDI to HDMI Converter's power supply jack and to an available electrical outlet. To remove the power supply plug from the unit, disengage the lock by pulling back on its plastic sleeve. The power LED indicator will glow in blue to indicate that the unit is powered on. The HDMI In LED indicator will glow in green to indicate that an active HDMI source is present.Use the USB Mini-B port with Gefen Syner-G� software suite for EDID customization as well as performing firmware updates. See the user manual for details. 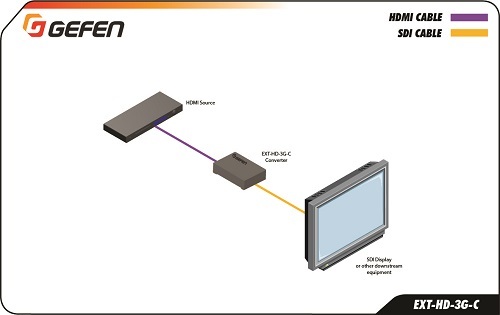 Note: The Gefen EXT-HD-3G-C is not compatible with HDCP encoded HDMI content. 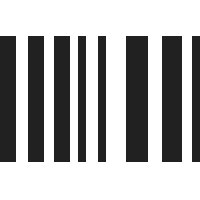 If the input signal is HDCP-encoded, there will be no SDI output.